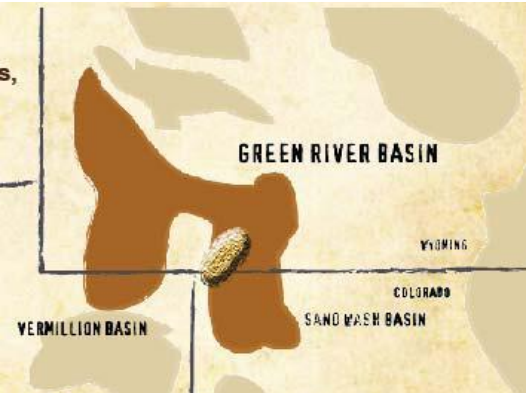 The Hilliard-Baxter-Mancos shale gas play is located in the Greater Green River Basin in Wyoming and Colorado. According to Deutsche Bank, this is an environmentally sensitive region with high bottom hole pressures that complicates drilling completions. Other average properties were estimated for the Barnett-Woodford shale play. 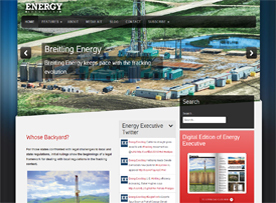 These include the depth (14,750 ft.), thickness (3,075 ft), porosity (4.25%) and total organic content (1.75%) for the shale. In 2008, there were 5 companies holding leases in the Hilliard-Baxter-Mancos shale play Based upon these lease holdings, the total active area is calculated at 385,634 net acres (603 square miles). In 2008, Deutsche Bank reported an average well cost of $20 million dollars for the Hilliard-Baxter-Mancos shale play. 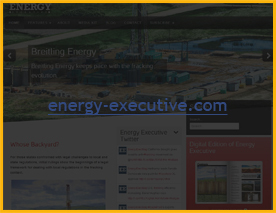 There is minimal information published for the current and future drilling activities of the companies who are currently holding leases within the shale. In 2002, the USGS conducted an assessment of the Hilliard-Baxter-Mancos shale play. Their estimated area was 16,416 square miles. The USGS estimated that the total undiscovered resource for Hilliard-Baxter-Mancos continuous gas between 4.9 and 22.7 TCF with a mean undiscovered resource of 11.8 TCF.